Change things up with a short trip to Wat Phra That Doi Suthep in Doi Suthep (about 1h 15 min away). Spend the 28th (Fri) wandering through the wild on a nature and wildlife tour. The adventure continues: soothe aching muscles at some of the top local wellness centers, take in the spiritual surroundings of Wat Ched Yot, stop by G.G Armani collection, and admire the striking features of Wat Chet Yot (Wat Maha Photharam). For traveler tips, more things to do, ratings, and more tourist information, refer to the Chiang Mai online travel route builder . Agadir, Morocco to Chiang Mai is an approximately 22-hour flight. You can also do a combination of shuttle and flight; or do a combination of bus and flight. The time zone changes from Western European Time (WET) to Indochina Time (ICT), which is usually a 7 hour difference. In December, plan for daily highs up to 34°C, and evening lows to 20°C. Cap off your sightseeing on the 29th (Sat) early enough to travel to Patong. Start off your visit on the 30th (Sun): kick back and relax at Karon Beach, then enjoy the sand and surf at Patong Beach, and then relax and rejuvenate at some of the top local wellness centers. To find traveler tips, ratings, other places to visit, and tourist information, read our Patong road trip planner. You can fly from Chiang Mai to Patong in 3 hours. Other options are to drive; or take a bus. Traveling from Chiang Mai in December, you can expect nighttime temperatures to be somewhat warmer in Patong, with lows of 26°C. Cap off your sightseeing on the 30th (Sun) early enough to travel to Ko Lanta. 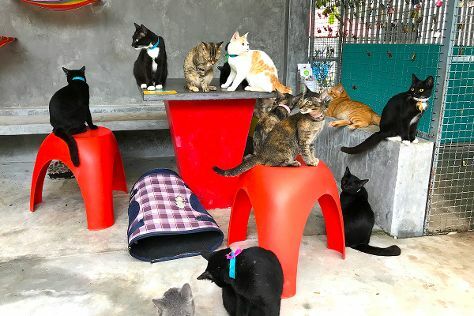 Kick off your visit on the 31st (Mon): kick back and relax at Lanta Klong Nin Beach, then look for all kinds of wild species at Lanta Animal Welfare, then kick back and relax at Long Beach, and finally stop by Fashion Point. For more things to do, reviews, ratings, and tourist information, you can read our Ko Lanta trip maker website . Traveling by combination of car and ferry from Patong to Ko Lanta takes 2.5 hours. Alternatively, you can ride a ferry. In December, daytime highs in Ko Lanta are 36°C, while nighttime lows are 26°C. Cap off your sightseeing on the 31st (Mon) early enough to catch the ferry to Ko Phi Phi Don. Start off your visit on the 1st (Tue): stroll through Laem Tong Bay, explore the activities along Maya Bay, and then head off the coast to Ko Phi Phi Le. To find where to stay and other tourist information, go to the Ko Phi Phi Don road trip app . Traveling by ferry from Ko Lanta to Ko Phi Phi Don takes an hour. Expect a daytime high around 36°C in December, and nighttime lows around 26°C. Cap off your sightseeing on the 1st (Tue) early enough to catch the ferry to Krabi Town. Kick off your visit on the 2nd (Wed): stop by Alex's Fashion, look for gifts at Scandi Fashion, then kick back and relax at PhraNang Cave Beach, and finally enjoy the sand and surf at Railay Beach. For other places to visit, where to stay, ratings, and other tourist information, go to the Krabi Town driving holiday planner. Traveling by ferry from Ko Phi Phi Don to Krabi Town takes 1.5 hours. Alternatively, you can do a combination of ferry and bus. 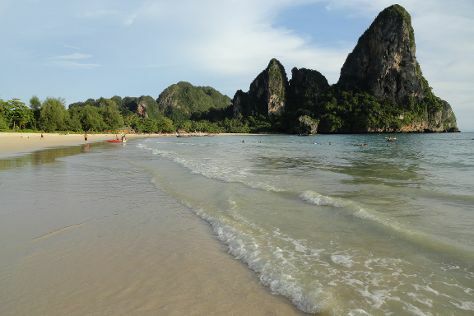 January in Krabi Town sees daily highs of 37°C and lows of 26°C at night. 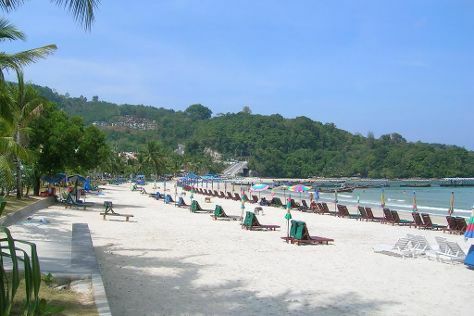 Wrap up your sightseeing on the 2nd (Wed) early enough to travel to Koh Tao. Start off your visit on the 3rd (Thu): see some colorful creatures with a scuba or snorkeling tour. To see other places to visit, photos, more things to do, and other tourist information, read our Koh Tao holiday builder app . Getting from Krabi Town to Koh Tao by combination of bus, flight, and ferry takes about 5.5 hours. Other options: do a combination of bus and taxi; or do a combination of bus and ferry. Expect a bit warmer evenings in Koh Tao when traveling from Krabi Town in January, with lows around 30°C. Finish up your sightseeing early on the 3rd (Thu) so you can travel to Bangkok. Bangkok is known for historic sites, shopping, nightlife, spas, and nature. Your plan includes some of its best attractions: step into the grandiose world of The Grand Palace, contemplate in the serene atmosphere at Temple of the Emerald Buddha (Wat Phra Kaew), browse the different shops at Siam Paragon, and look for all kinds of wild species at SEA LIFE Bangkok Ocean World. For other places to visit, photos, more things to do, and more tourist information, you can read our Bangkok trip itinerary planner . Getting from Koh Tao to Bangkok by combination of ferry, flight, and train takes about 6 hours. Other options: do a combination of ferry, taxi, flight, and bus; or take a bus. Expect a bit cooler evenings in Bangkok when traveling from Koh Tao in January, with lows around 26°C. Finish your sightseeing early on the 6th (Sun) so you can travel back home.